Jesus freak Hideout: Where has Smalltown Poets been between your last record, Third Verse, and today? Michael Johnson: I got married. My wife, Amy and I started a family. Our son, Larkin, Was born last February. Smalltown Poets has still been out playing just not quite as often and the benefit has been that we have had more time for songwriting and recording. JFH: Can you tell us a bit about your eagerly anitcipated forthcoming new release? Michael: We are doing it all ourselves except for the final mix. Matt has a studio in an area of Atlanta called "Little Five Points" where we have been working. Matt is a really good engineer and producer so we enjoyed having creative freedom especially since we started the project not knowing who would release it to the public. The songs may be a little too diverse, but we happen to like a variety of music so our writing reflects that broad influence. For instance there is this one song that will close the record that is sort of a post-modern hymn. We all grew up with the rich language and imagery of hymns and wanted to include a song inspired by our memory of those things. It will most likely be titled "In The Shadow Of My Days" in the tradition of many hymns that use the first line as a title. "In The Shadow Of My Days" is my favorite track right now. The whole album shifts moods from celebration to self reflection and from praise to a bit of sarcastic criticism. "Upside Down" is a song inspired by a story my wife told me about using a mirror as a little girl to pretend she was walking on the ceiling as well as the book "The Upside Down Church" by Greg Laurie. JFH: How did Smalltown come to be a part of the BEC Recordings family? Michael: First let me say a big Thank You to Ardent and Forefront Records. We had a great time getting to know some wonderful people and we are grateful for the hard work they dedicated to introducing our music to others. When our recording agreement lapsed and a mutual decision was made to end re-negotiations we had a unique opportunity to look for a label that we believed would be the best fit for us at this point. A friend introduced me to Brandon Ebel, who started Tooth and Nail ten years ago and more recently launched BEC Recordings. Brandon reminded me that we had met at a music club in Memphis, TN called the New Daisy. 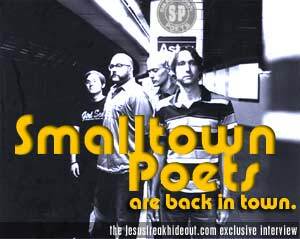 Smalltown Poets was new at that time and he said he has been a fan since hearing us play. How could I resist such sincere flattery? Seriously, it became evident very quickly that we have very similar vision in regard to making music for Christians that at the same time creates a sort of foyer environment for people who may not totally understand what we believe. We believe BEC wants and we want our music to be compelling to people whether they are inside or outside or in the process of discovering the Christian faith. We think BEC Recordings is the right label to partner with because they understand what we have done in the past and where we want to go from here. As a matter of fact, I don't know if I should say this, but no one at BEC heard any of the new songs before we signed an agreement. What a vote of confidence! That inspired us to reach as deeply as we could to make the best record possible. JFH: How will this new record differ from previous records? Michael: Well besides the obvious difference of being ten new original songs there are some other things of note. :>) We have had complete artistic freedom from start to finish from choosing which microphone to use to record the guitar amp and going all night when things were happening (apologies to wives and girlfriends) to re-recording entire songs when we thought of a better idea or calling it a day when it just didn't feel right. There is still a fairly minimalistic approach to production overall but some of the songs have more layers especially in regards to melody. The songs are still inspired by the way we see the world, you know trying to describe it in our own words. I think lyrically it is the closest we have come to marrying simple and creative language as our name suggests. JFH: What has God been teaching you lately through all of SP's recent experiences? Michael: Jim Thomas, a Pastor/Author friend recently sent me a quote from C.S. Lewis. Lewis wrote something like, "Aim at heaven and get the earth thrown in, aim at earth and get nothing". Life is an incredible gift that God has given us on purpose, and I can cruise through it aimlessly or enjoy it and make the most of it in light of what I know about eternity and God's intentions for me while I am here. One of the new songs, a song called "Here" touches on that a bit. I have been enjoying life with my wife and son, serving my local church, creating good music with friends and trying to let my whole life be worship rather than this bit here or that bit there. All that God has done is because he loves the earth and what He has made. He is very interested in what we do with it and how we handle a crisis - small like helping a friend or neighbor through a hard time, and large like war in Iraq and Afghanistan or the AIDS pandemic. Any time we take courage and do what we believe is right we are not doing it alone. I love the way Jackson and the cast of The Lord Of The Rings brought Tolkien's epic story of good persevering to our movie theaters. This trilogy and Mel Gibson's The Passion Of The Christ are important works of art for our time. What will we let them and God's spirit inspire us to do? JFH: What can fans expect from SP this year? Michael: We will be playing shows as much as possible. Everyone should contact their favorite music festival to make sure they know Smalltown Poets will be touring to support our new record. We are trying to keep fans informed through smalltownpoets.com and a new email list that we will use to give news updates and concert information.